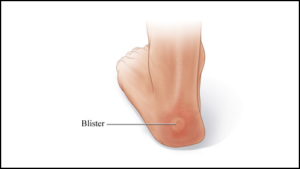 Blisters are painful skin irritations that can appear anywhere on our bodies. However, they most often show up on the feet. In order to prevent blisters you should make an effort to protect your feet. Wearing socks can help prevent your feet from rubbing against your shoes, which causes blisters on your feet. You can also apply powder to your feet to help reduce friction when your skin rubs together. Untreated blisters on your feet can worsen and make mobility extremely difficult and painful. For quality blister treatment, contact one of our podiatrists from Foot HealthCare Associates. Our doctors will attend to all of your foot and ankle needs and answer any of your related questions. How do Blisters on Your Feet Form?